RUSKIN — Coach Zerko Stojakovich’s boys basketball team faces a crucial stretch as it seeks to improve its rank in the 8A District 9 standings. 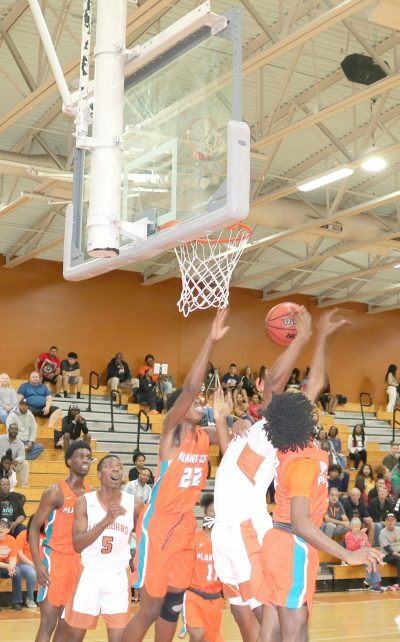 Lennard traveled to Strawberry Crest on Jan. 15, played at Plant City on Jan 16, plays at home with Tampa Bay Tech on Jan. 18, and at East Bay on Jan. 22. After a close loss to Riverview 76-72 in the championship finals of the Hernando Holiday Tourney, the Longhorns put together back-to-back wins over Bloomingdale 51-49 in Valrico and then beat Middleton 56-45 at Lennard. The Jan. 11 win over Middleton put Lennard at 10-5 overall and 3-3 in district, midway in those standings. Plant City is atop the district, trailed by Tampa Bay Tech and Strawberry Crest. The Longhorns have already far surpassed their victory totals for the past four seasons. The last winning record registered by the Longhorns was under Coach Gaddis at 25-5 in 2013-14. In Zerko’s first season, the Longhorns finished 7-15 overall and 3-9 in district in 2017-18. In the nail-biter at Bloomingdale last week, the Longhorns trailed by 9 in the third quarter when they rallied to pull it out on late buckets by Maurice Pickett and two pressure-packed free throws by Rae’Shaun Wilson. Providing most of the offense against Bloomingdale were Wilson 14; C.J. Peterson 12; Pickett 9; Aaron Jensen and Jayden Lacey 5 each; and Brandon Flannery 4. The week was capped off last Friday by building an early lead over Middleton. Cruising along with an 18-point cushion in the third quarter, Lennard was threatened by a Middleton rally led by their junior star Mike Sholtz who erupted for 23 points. The Longhorns finally got it under control and nailed down the victory. Point leaders for Lennard were Peterson 22; Wilson 14; David Flannery 7; Lacey 6; and Casey Johnson 5. Coach Dominic Coco’s boys soccer bounced back to win over King in Tampa 4-0 Jan. 11. That put their overall record at 8-2 and 4-2 in district. The boys had dropped a 6-0 match to Bloomingdale earlier in the week. They traveled to take on Hillsborough Jan. 15. Freedom comes to Lennard for a Jan. 18 match at 8 p.m. Newsome will follow for a Jan. 22 game at the same time. 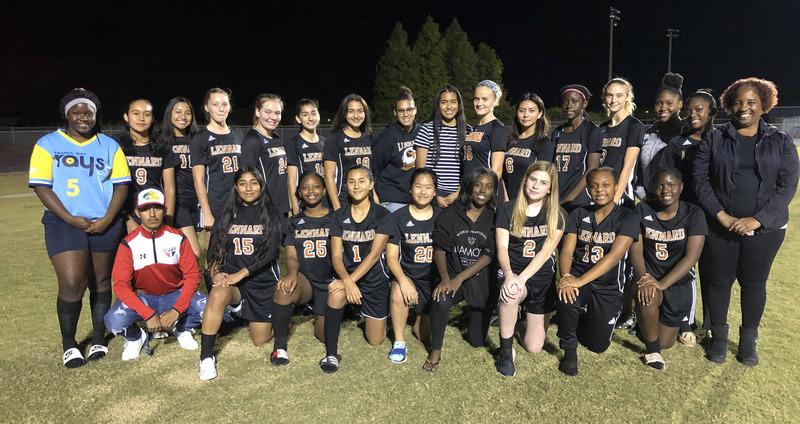 The Lennard Longhorns’ girls soccer has completed all conference games and have three remaining non-conference games that conclude on Tuesday, Jan. 22. Then district championships will start Thursday, Jan. 24, at Bloomingdale High School. Matches will be played at 3, 5 and 7 p.m. In games last week, the Longhorns’ Kathleen O’Hair had a solid game in goal Jan. 8 in a 3-1 loss against Bloomingdale High School. O’Hair made 10 saves in an aggressive and hard fought match against Bloomingdale, last year’s district champions. She stepped in for the first keeper who was out for personal reasons and shouldered enormous pressure and represented her team well. O’Hair’s team told her how proud of her they were. Coach Vanessa Escobar said “hats off” to her entire team for the best performance of the year. Kaitlyn Tyler was selected the Lennard girls soccer Player of the Game at Tampa Jan. 11. Tyler was tough and aggressive in Friday night’s 4-2 conference loss at King High. She chased down and fought off players who were skilled and exceptionally fast. Escobar praised Tyler for sacrificing her body all game long to help her team stay competitive in the game. She displayed leadership by her play and maintained the attitude of a champion. Tyler was a true warrior in a very difficult match as Lennard was without two key players. The Lady Longhorn conference record stands at 1 win 3 losses 2 ties with no conference games left to play. The Lady Longhorns have three regular season non- conference games left to play. The opponents are Hillsborough Jan. 15, Freedom Jan. 18, and Newsome Jan. 22. 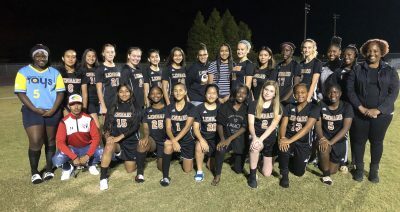 Lennard Girls Soccer: Front row: volunteer coach Rigo; #15 midfielder Brenda Rodriquez; #25 defender Zaria Goldson; #1 midfielder Gisselle Ramos; #20 defender Bailey Robinson; #7 midfielder Amiya Shelman; #2 defender Madison Bennett; #13 forward Aniah Rasool; and #5 forward Gabrielle Michel. Second row: goalkeeper Clautide Michel; #9 defender Jazmin Vargas; #11 midfielder Izahri Sanchez; #21 midfielder Victoria Blaszyk; #24 defender Kaitlyn Tyler; #10 midfielder Alissa Lopez; #19 midfielder Jocelyn Diaz; goalkeeper Karina Ramis-Davis; volunteer Johanna Ramirez; goalkeeper Kathleen O’Hair; #6 midfielder Larissa Saldana; #17 midfielder Olivia Michel; #3 forward Sadieann Vitale; volunteer coach Fedelly Felinor; #12 midfielder Shanya Luke; and head coach Vanessa Escobar.